Bucilla Felt Home Decor accents are a pleasure to stitch and to display. From delightful three dimensional table-top centerpieces to wall hangings of splendor, this collection is sure to bring the joy of the season to any room in your home. Decorate your home for fall with this beautiful wreath celebrating the autumn harvest. Size: 15" x 15". Ol' Kris Kringle is here to greet the Christmas season with his candy cane in tow in the "Hello Santa" felt stocking kit from Bucilla. Kit includes stamped felt, embroidery floss, sequins, beads, needles and tri-lingual instructions, PLUS a bonus ornament! Create holiday traditions with heartwarming designs. Each kit includes felt, beads, sequins, embroidery floss, needle and easy-to-follow instructions. 15" x 24". 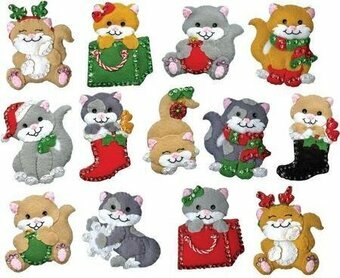 Felt Applique Christmas Ornament Kit featuring cats. Felt Applique Kit Includes 100% Acrylic Felt, 100% Cotton Embroidery Floss, Sequins, Beads, Needle, Fully Illustrated Chart & Instructions. 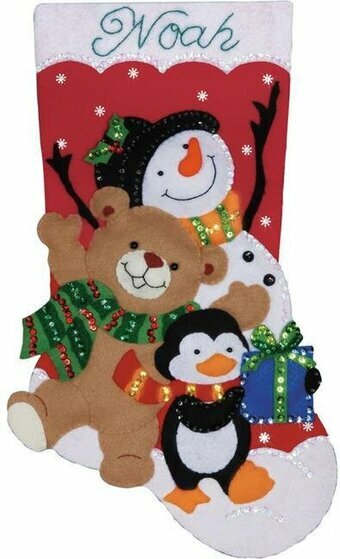 Felt Applique Christmas Stocking Kit featuring a snowman, a penguin, and a teddy bear. Felt Applique Kit Includes: 100% Acrylic Felt, 100% Cotton Embroidery Floss, Stocking Back, Trims, Needle, Fully Illustrated Chart & Instructions, 18" long. There's no place like home for the holidays! 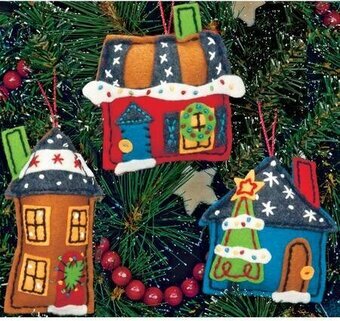 Create these colorful felt applique Holiday Homes Ornaments with a few simple embroidery stitches. Finished Size: up to 5" high not including hangers, set of 3. Contains presorted thread, cording, die-cut felt, stuffing, needle, and easy instructions. Continue the holiday traditions with new heart-warming designs for this special family season. Each kit contains felt, beads, sequins, embroidery floss, needle and easy-to-follow instructions. Size: 18" diagonal. 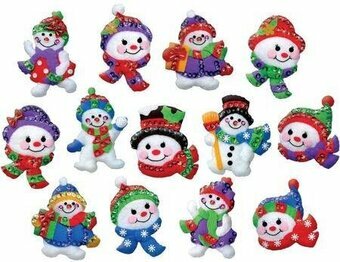 Felt Applique Christmas Ornament Kit featuring snowmen. Felt Applique Kit Includes 100% Acrylic Felt, 100% Cotton Embroidery Floss, Sequins, Beads, Needle, Fully Illustrated Chart & Instructions. 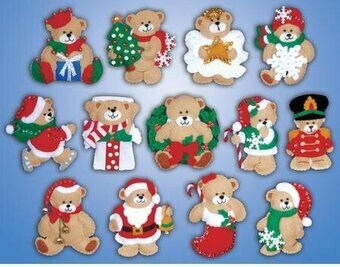 Felt Applique Christmas Ornament Kit featuring lots of teddy bears. This applique felt kit includes: 100% Acrylic Felt, 100% Cotton Embroidery Floss, Trims, Needle, Fully Illustrated Chart & Instructions. Finished size approximately 4"x3". A mug of steaming coffee, creamy hot chocolate or spicy comforting tea warms both bodies and souls. The Merry Mug ornaments have the same effect. Make them for the tree or for gift giving. Each mug is open at the top and can be filled with gift cards or other small treasures. 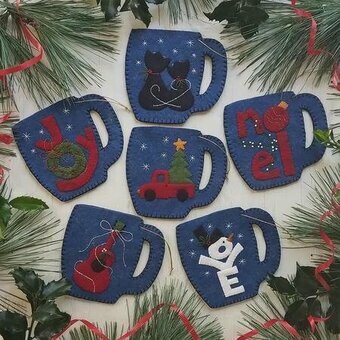 Kit includes wool felt, embroidery floss and gold string plus precise patterns and illustrated instructions to make six mug ornaments. Mittens and Stockings Advent Calendar. 14.5" x 23.25". Create holiday traditions with heartwarming designs. Each kit includes felt, beads, sequins, embroidery floss, needle and easy-to-follow instructions. 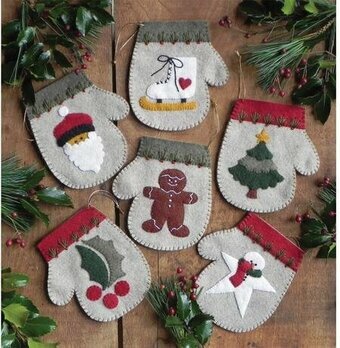 Mittens Ornament Kit features a collection of six mittens. Can be filled with candy canes, money, or other small treasures. Designs included: a plump snowman, holly sprig, santa, pine tree, delicate snowflake, and pine cone. Suitable for trimming the tree and gift giving. Size: 4-1/4" tall. This felt applique kit includes: wool felt, embroidery floss, star buttons and beads for embellishment, gold string for hanging, iron-on transfer patterns for embroidery, and complete illustrated instructions. Made in USA. The whole family will love counting down to St. Nick's arrival with this whimsical calendar. 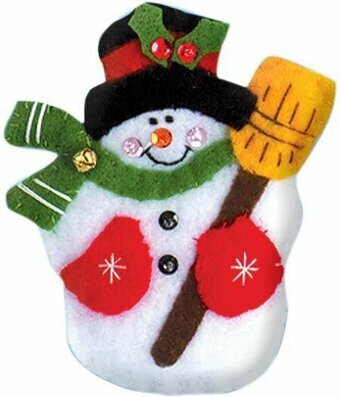 Kit includes felt applique, ornament sets and wall hangings. Size: 13" x 25". Add a touch of Scandinavian style to your Christmas home decor this year with the "Nordic Snowman" felt wall-hanging kit from Bucilla. Kit includes stamped felt, embroidery floss, sequins, beads, needles and tri-lingual instructions. Size: 8" x 25". Kit includes stamped felts, cotton floss, color separated sequins & beads, two needles, and instructions. Finished Size: 17" x 24". Create holiday traditions with heartwarming designs. Each kit includes felt, beads, sequins, embroidery floss, needle and easy-to-follow instructions. 18" long. Deck the halls this holiday season with this gorgeous felt stocking featuring a dashing reindeer with antlers bedecked with Christmas ornaments, garlands, and string. 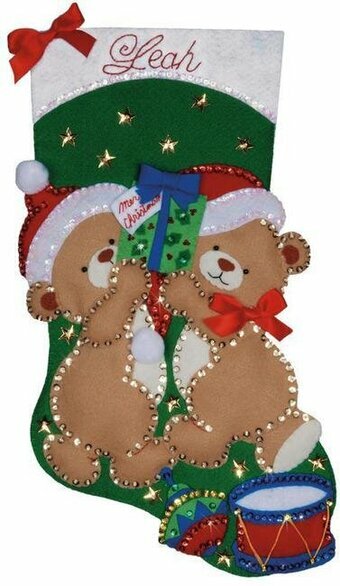 The twinkle of the stars and the sequins will make this stocking shine on your mantel. Kit includes stamped felt, embroidery floss, sequins, beads, needles and tri-lingual instructions. Size: 18" diagonal. Create holiday traditions with heartwarming designs. Each kit includes felt, beads, sequins, embroidery floss, needle and easy-to-follow instructions. 15" round. Have fun with your Halloween decor with Bucilla's Halloween felt wall hangings. The kit includes everything you need to get started: stamped felt, sequins, beads, embroidery floss, needles, and instructions. Great for all ages and skill levels, this fun design is sure to be a Halloween hit. For generations, Bucilla has been providing stitchery enthusiasts with the tools to create handmade keepsakes. Size: 15" x 20.5". Felt Applique kit featuring a Christmas Stocking with a Snowman and Poinsettia flowers. This felt applique kit comes includes 100% Acrylic Felt, 100% Cotton Embroidery Floss, Stocking Back, Trims, Needle, Fully Illustrated Chart & Instructions. 18". This Felt Applique Kit Includes: felt, sequins, beads, trims, cotton floss, needle, patterns and instructions. 18" Long. This Felt Applique Kit Includes: 100% Acrylic Felt, 100% Cotton Embroidery Floss, Beads, Sequins, Trims, Needle, Fully Illustrated Chart & Instructions. 3" x 4". 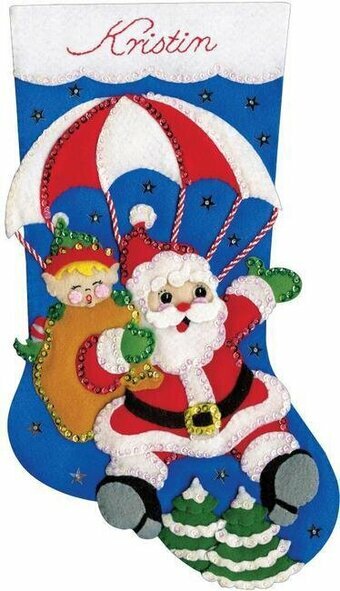 Felt Applique kit featuring a Christmas Stocking with Santa Claus. This felt applique kit comes includes 100% Acrylic Felt, 100% Cotton Embroidery Floss, Stocking Back, Trims, Needle, Fully Illustrated Chart & Instructions. 18". 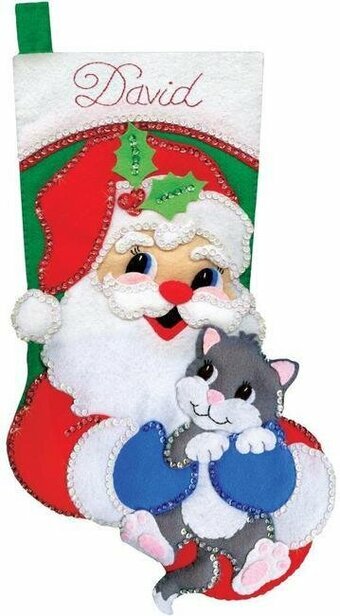 Felt Applique Christmas Stocking Kit featuring Santa Claus with a kitten. Felt Applique Kit Includes 100% Acrylic Felt, 100% Cotton Embroidery Floss, Stocking Back, Trims, Needle, Fully Illustrated Chart & Instructions. 18" long Christmas Stocking. Jolly Old Saint Nick is counting down the days until Christmas on Santa's Advent Calendar by Bucilla. Featuring multiple Santas with their bounty of gifts and a vibrant holiday color palette, the calendar is the perfect way for the family to commemorate the days leading up to Christmas. The kit includes everything needed to create the calendar banner, including: felt backing, 100% cotton embroidery floss, needle, and simple instructions. Size: Approx. 9" x 34". Felt Applique Kits - Item #K86685 - See More Items Like This On Clearance! 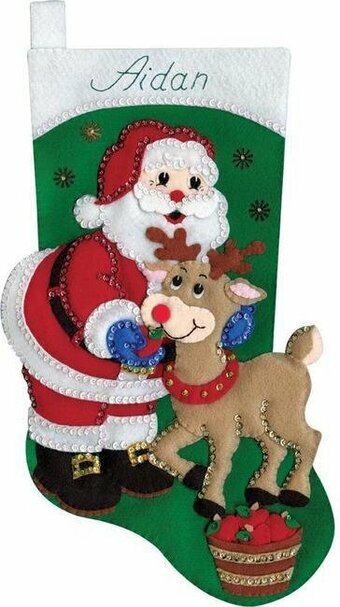 Brighten your holiday home decor with the folksy charm of the "Santa's Reindeer Barn" felt wall-hanging kit from Bucilla. Kit includes stamped felt, embroidery floss, sequins, beads, needles, instructions, and LED lights to illuminate the wall-hanging. Requires 2 AA batteries (not included). Size: 15" x 21-1/2". Create holiday traditions with heartwarming designs. Each kit includes felt, beads, sequins, embroidery floss, needle and easy-to-follow instructions. 18" x 22". Festive designs, quality materials and generous embellishments continue to make Bucilla felt stockings a favorite stitchery tradition. Stocking kits include: stamped felt, embroidery floss, sequins, beads, needles and tri-lingual instructions. Size: 18" diagonal. This Felt Applique Kit Includes: 100% Acrylic Felt, 100% Cotton Embroidery Floss, Stocking Back, Trims, Needle, Fully Illustrated Chart & Instructions. 18" Long. 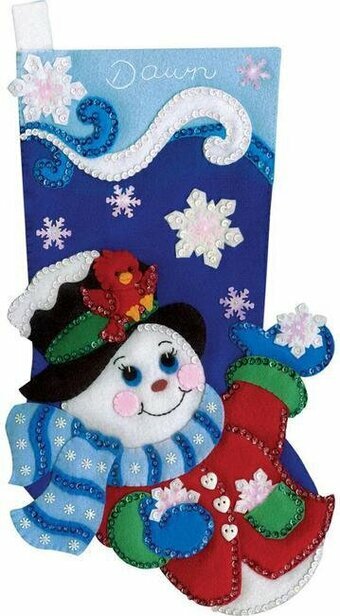 Felt Applique kit featuring a Christmas Stocking with a Snowman. This felt applique kit comes includes 100% Acrylic Felt, 100% Cotton Embroidery Floss, Stocking Back, Trims, Needle, Fully Illustrated Chart & Instructions. 18". A trio of snowpeople prepare for a night of caroling in the "Snowman Family Band" felt stocking kit from Bucilla. The kit includes everything needed to create the 18" stocking, including: felt backing, 100% cotton embroidery floss, needle, color-separated sequins and beads, and simple instructions. Size: 18" diagonal. Welcome neighborhood carolers this holiday with the "Snowman Family Band" wreath from Bucilla. Kit includes stamped felt, embroidery floss, sequins, beads, needles, and instructions. Size: 15" x 16-1/2". Add a fun snowman motif to your holiday home decor with the "Snowman Tree" wall-hanging from Bucilla. Bucilla Felt Home Decor accents are a pleasure to stitch and to display. 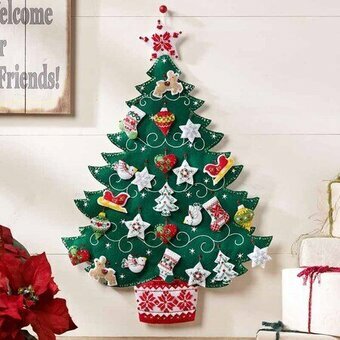 From delightful three dimensional table-top centerpieces to wall hangings of splendor, this collection is sure to bring the joy of the season to any room in your home. Size: 17" x 26-1/2". 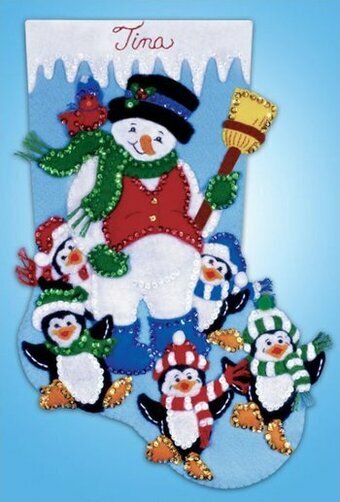 Felt Applique Christmas Stocking Kit featuring a snowman with lots of enthusiastic penguins. Felt Applique Kit Includes: 100% Acrylic Felt, 100% Cotton Embroidery Floss, Stocking Back, Trims, Needle, Fully Illustrated Chart & Instructions, 16" long. 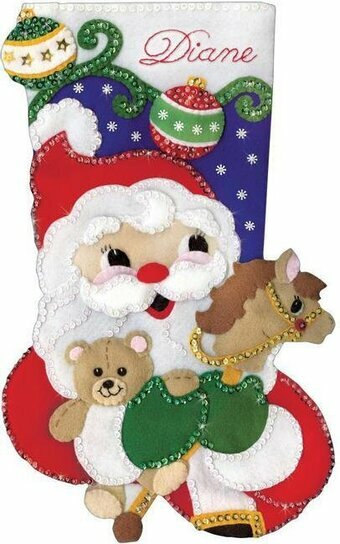 Felt Applique Christmas Stocking Kit featuring a snowman with teddy bears. Felt Applique Kit Includes 100% Acrylic Felt, 100% Cotton Embroidery Floss, Stocking Back, Trims, Needle, Fully Illustrated Chart & Instructions. 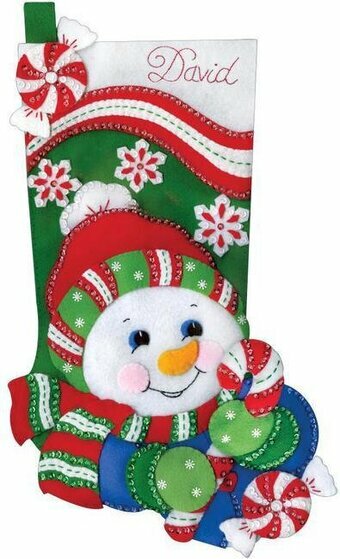 18" long Christmas Stocking. This Tropical Flamingo by Dimensions comes together with basic embroidery stitches on felt with pre-punched holes. It's a perfect beginner felt applique design that includes easy step-by-step instructions. Finish in the included wood hoop. Finished size: 6" diameter. This felt applique kit contains thread, die-cut felt, hoop, bead, needle, and instructions. Kit contains: cotton thread, cording, die-cut polyester felt, polyester stuffing, needle and easy instructions. 2-3/4" x 4-3/4" Set Of 3. Two merry snowmen and a snowcapped wonderland make up the view in Bucilla's "Winter Window" felt wall hanging. 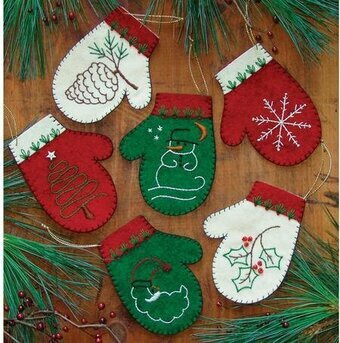 This festive felt stitchery project includes everything you need to get started: stamped felt, sequins, beads, embroidery floss, needles, and instructions. 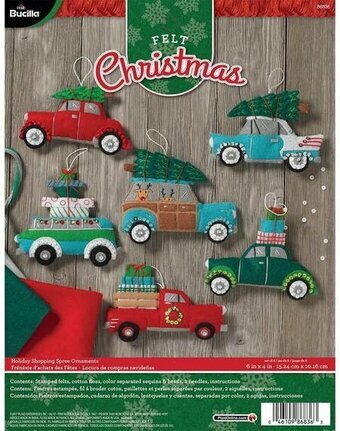 Great for all ages and skill levels, this happy holiday wall-hanging is sure to be a hit. Size: 15" x 21". Fun to make! Create whimsical felting creations for any purpose and occasion with ease! This package contains pre-sorted thread, die-cut felt, one needle and easy to follow instructions. Finished size: 19 inches long. 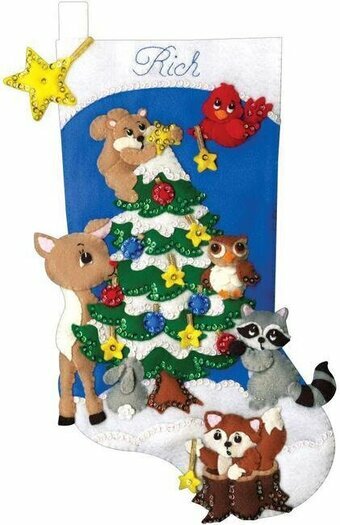 Felt Applique kit featuring a Christmas Stocking with a Christmas tree and woodland animals. This felt applique kit comes includes 100% Acrylic Felt, 100% Cotton Embroidery Floss, Stocking Back, Trims, Needle, Fully Illustrated Chart & Instructions. 18".